A few years back I met with Kelly the owner of the Palmer to preform a little investigation of the claims this place was having.I have seen a lot and been to a lot of different haunted places & this place gave me the chills.During my stay here. 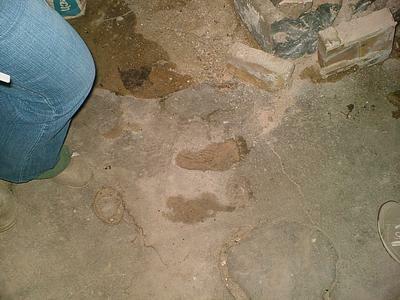 I experienced voices talking, a growling sound, and a fresh wet foot print that just appeared out of the wall and dried up pretty fast. This place is definitely creepy. Once I was done playing ghost hunter with Kelly and her friend I headed up to my room at about 4am a voice called out a name. I slept with the lights on that night. If you don't mind sleeping with some ghosts this a great little stay and Kelly is great host. The Palmer Hotel seems to have a lot of true paranormal activity! Thank you for conducting your ghost investigation on the claims associated with the haunted hotel and reporting them back to us here at Haunted Places to Go! If you pack up your ghost hunting equipment and head back out to the hotel, be sure to update us with any more evidence you may gather on paranormal spirits in the building. We appreciate your submission! Join in and write your own page! It's easy to do. How? Simply click here to return to Haunted Hotels in the Midwest.